Pulse Breath Water is an immer­sive vir­tual envi­ron­ment manip­u­lated by the pulse of a participant’s breath that pro­vokes and chal­lenges the inter­ac­tion between a user and the sub­stan­tial ele­ment of the envi­ron­ment: water. The system “senses” the par­tic­i­pant, while the participant’s breath­ing feeds the system. The process is a sym­bi­otic play between inter­nal human processes [biosens­ing the participant’s breath] and the system’s agency that guides the par­tic­i­pant between the state of calm and the state of anxiety. 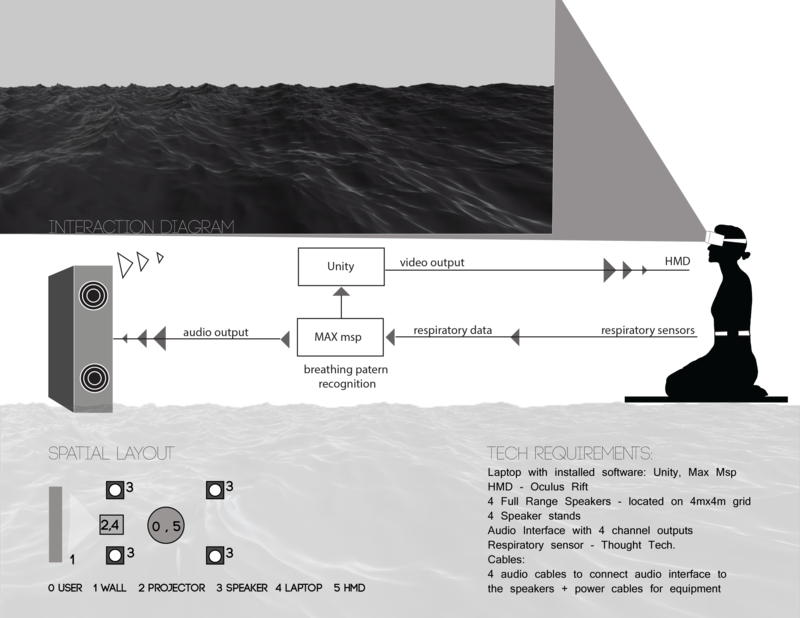 Minimalistic yet sym­bi­otic play is sup­ported by the multi-agent system that gen­er­ates sound through a nego­ti­a­tion (of dif­fer­ent affec­tive states) between agents. The behav­iour and aes­thetic qual­ity of sound and visu­als are the result of the system’s deci­sions, as long as the par­tic­i­pant is con­sent, present, and breathes. Here’s a video of Mirjana’s pre­sen­ta­tion on “Living In A Box: Potentials and Challenges of Existence in VR” from the Consumer Virtual Reality (CVR) show in Vancouver (May 2016). Prpa, M., Tatar, K., Pasquier, P., & Riecke, B. E. (2016, March). 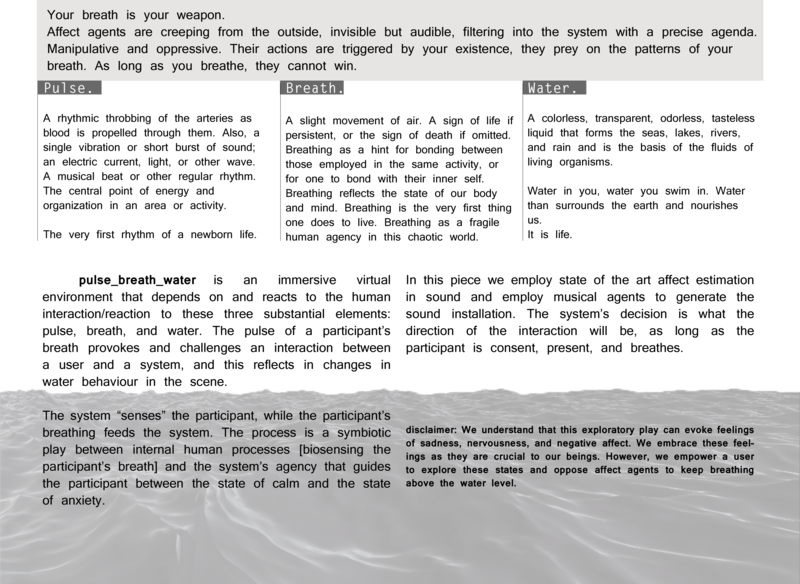 Pulse Breath Water. Exhibition pre­sented at the scores+traces (group exhi­bi­tion), One Art Space, NY, USA. Prpa, M., Tatar, K., Pasquier, P., & Riecke, B. E. (2016, November). Pulse Breath Water. Exhibition pre­sented at the MUTEK International Festival of Digital Creativity and Electronic Music: MUTEK_IMG + VR Salon, Montreal, Canada. Prpa, M., Tatar, K., Pasquier, P., & Riecke, B. E. (2016, July). 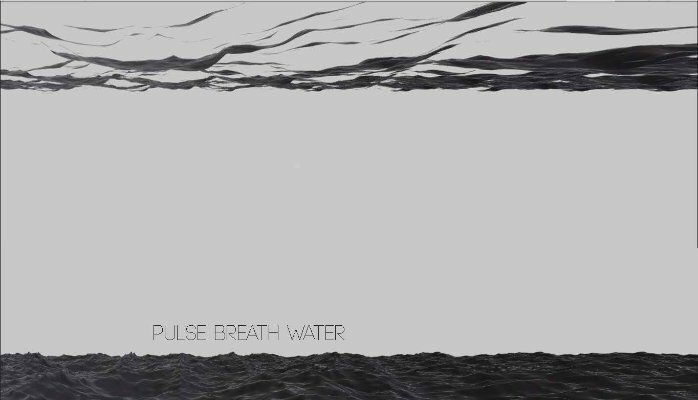 Pulse Breath Water. Exhibition pre­sented at the P.O.E.M.A. by Regina Miranda, Oi Futuro Flamengo, Rio de Janeiro, Brazil. Prpa, M., Tatar, K., Pasquier, P., & Riecke, B. E. (2016, May). Living In A Box: Potentials and Challenges of Existence in VR. Talk pre­sented at the Consumer Virtual Reality (CVR) Conference, Vancouver, BC, Canada.